For more than 50 years our family has raised sheep in the Pacific Northwest. Over time the crops and livestock produced at Reister Farms have varied, but sheep remain our primary focus. The passion and attention to detail practiced at Reister Farms can be found in everything we do, and we believe it separates our lamb from the rest. 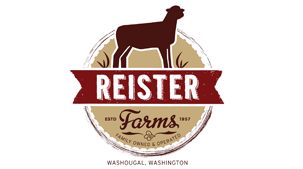 We invite you to take a look around Reister Farms, read our story and learn about the difference that is Reister Lamb.